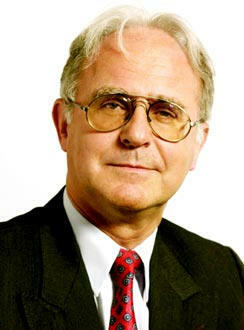 Mr. Senger began his radio career with Deutsche Welle in 1965 after receiving his degree in Broadcast Engineering. He has gone on to work throughout the DW organization, Chairing the DRM Consortium and becoming the first to receive a lifetime achievement award from EBU. We are pleased to offer some of his insights on DRM. Mr. Senger, Nearly 15 years after the initial proposal for DRM, where do you feel we are? "The first two years were lost due to some big players putting more emphasis on satellite radio such as WorldSpace. Some French and German parties continued during those two years and when the other came back because they understood that satellite radio cannot replace terrestrial broadcast we really started in 1998 with the development. And we used only 5 years to develop a complete new digital broadcasting system which is the shortest time ever. We presented the DRM-system to the members of the WARC 2003 in Geneva and from this moment onwards it was ready for usage. But there were no receivers at that time, just some prototypes from MAYAH. The big players were always waiting for the first big quantity on the market before they wanted to start. This critical mass of some 10.000 units was never reached." "So the development was not slow but even very fast, the implementation was the problem even with the biggest commercial broadcaster in Europe, RTL Radio, as the main player. RTL has decided to invest in the development of commercial low price DRM receiver together with radioscape from UK and Texas Instruments from USA. Unfortunately they were not able to solve the technical problems in the receivers. The development was mainly done by IT-experts and had the lack of RF knowledge. The DRM-modules were creating too much noise inside the receiver and it was never solved in a way that the DRM-Minimum Receiver Requirements could be fulfilled. Together with some experts from Deutsche Welle we improved the shielding and grounding in the Himalaya2009 which was based on the radioscape module and achieved good results. But then RTL and radioscape gave up and no more DRM receivers were development until many years later the UNIWAVE came to the market." Is there still hope for DRM as a worldwide replacement for AM/DSB in LW/MW/SW (especially in light of new digital and wireless solutions, Internet and other distractions)? "We have some countries which have decided to introduce DRM. Russia and India are the biggest, maybe some latin American countries will follow. They need very good low price DRM receivers and we are very close to get them on their markets at the right moment. It is very important that the receivers will be of first quality and that they will fulfill the DRM-MRR. I am very confident that the technical problems will be solved and that those markets will use DRM on a very large scale. The internet radio is a competitor for DRM but form many years to come not on a global scale, not everywhere and especially not mobile." What are some of the hurdles that have to be overcome for companies to offer mass market, reasonably priced, reliable and power conservative DRM receivers? "The main hurdle is the receiver intrinsic noise which has to be overcome. But also a DRM chip-set would be very important and this will come if big quantities of DRM receivers are needed." Are you aware of anything new or innovative in development in the DRM receiver world right now? DRM receiver manufacturers have been rather quiet lately, is something new coming soon? "Newstar, UNIWAVE and NXP [admin note: NXP is a chipmaker, not a maker of end-user products] are coming out with new DRM receivers and if they are ok their development could be used by other manufacturers, especially by those manufacturers in the new DRM countries as it is a must to produce them in the country." What is your relationship with CDNSE? "I am consulting CDNSE on the development of a low price DRM receiver, also for a DRM car receiver. They have asked me help selling the new receivers and I will do so on my own." What would you consider the most innovative use of DRM to date? Any favorite current DRM broadcasts/broadcasters/initiatives. I think the BBC WS is today doing a very good DRM service as Deutsche Welle did in the past. Also the Voice of Russia is very innovative and in the forefront of DRM broadcasters. And we should not forget AIR from India if they are really starting their national service." Will North America ever have room for DRM or is shortwave simply dead in the Americas? It appears it has no hope in MW or FM bands due to the Ibiquity situation. "DRM could have a very good chance in North America to cover large areas over long distances as it is cheaper than satellite radio for the broadcaster. The HD Radio from Ibiquity cannot compete with DRM in large areas as it would need to many transmitters either on FM or AM/MW. But the Ibiquity system is a very good development for their market, besides it is a proprietary system which DRM is not. But North America has a unit advantage compared to other parts in the world: One language for the whole country. Only China and Russia have this advantage, in Europe we have too many different languages." How would you characterize your time as DRM Consortium Chair? How would you characterize the time of the current Chair Ruxandra Obreja. "It was for sure the most interesting time of my professional time when I was chairing for ten years the DRM consortium, plus 3 years preparation in advance. To keep nearly 40 different nationalities from over 100 countries on track was my greatest experience with people from all over the world." "When the BBCWS was taking over from me and was also elected to chair the DRM consortium it was the best solution after I retired. As the technical issues where solved it was also very good to have Ruxandra chairing the steering board and put more emphasis on the marketing of DRM." What can the "lay person" DRM fan/aficionado do to help motivate or move forward DRM implementation. "I think we need people like you and your friends all over the world and keep DRM under discussion in your circles with the assistance of the DRM consortium. If countries like Brazil will finally decide for DRM and start introducing it this will push DRM in Latin America and might as well expand to the North as well. As far as I know your country only a big commercial broadcaster looking for coverage of the whole of North America could really introduce it successfully. This is different from countries like Russia and India were Public Broadcaster will introduce DRM because of a Governmental decision. But we should also not forget DRM+ which is now also available for market introduction and might pull DRM30 if it is introduced in a country." I appreciate your work and enthusiasm for DRM. I share it and hope my site is a positive contributor to the overall dialogue. Thanks for taking some time with us.